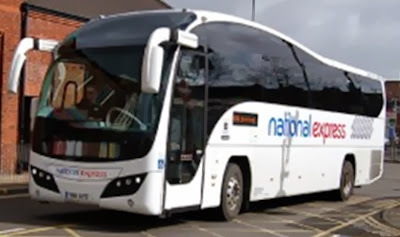 "I had been to Newcastle and was returning to London on a National Express coach. Typical of me I arrived at the departure point just before it was due to leave. The driver checked my ticket and said there was only one seat remaining. I didn't therefore have much choice but to sit in the second from back row in the aisle seat. The coach started up and away we went on the start of the journey. It was only then that I glanced properly at the person sitting in the adjacent aisle seat. It turned out to be one of my best friends from my school days. I recognised him straight away even though I hadn't seen him for over ten years. We had lots to catch up on. He told me he was supposed to have returned to London on the previous day but a problem happened at his aunt's house, where he was staying, and he altered his ticket to the day I was also travelling. I'd never thought much before about coincidences but this one made me stop and think. It also turned out that the company where my friend was working had a vacancy I had applied for and got. It was certainly like we were meant to meet up." Great synchronicity! And it sounds like it turned out to be pivotal for him, a new job and all!